Port Authority Signature® - Sueded Cap with embroidered color JSF logo. Ultra-softness of Tactel® nylon fabric. A CoolMax® sweatband adds moisture-wicking performance. Port & Company® Essential T-Shirt with the JSF logo on the left chest. 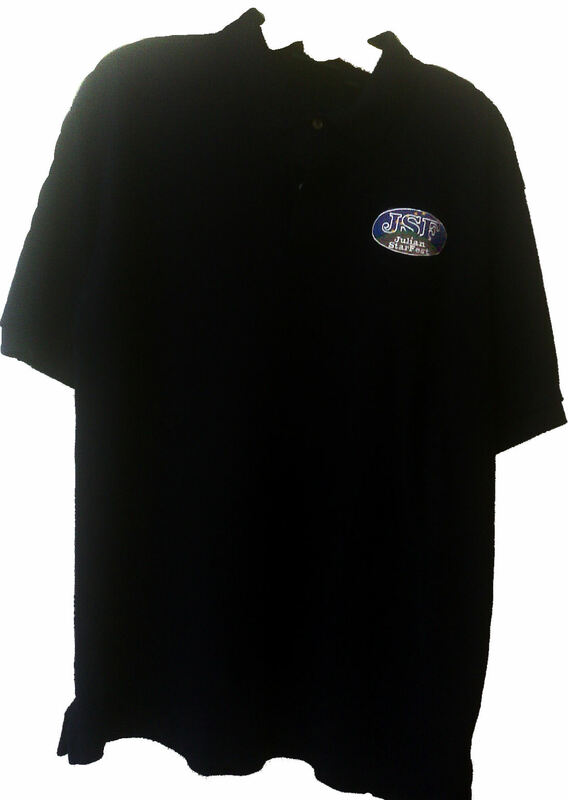 Port & Company® Essential T-Shirt with the JSF logo on the left chest and a Large JSF logo on the back. Port & Company® Essential T-Shirt with the JSF logo on the left chest and the “GEEK” graphic, glow-in-the-dark stars on the back. Outer Banks® - 6.8-Ounce Pique Knit Sport Shirt with embroidered color JSF logo on the left chest. 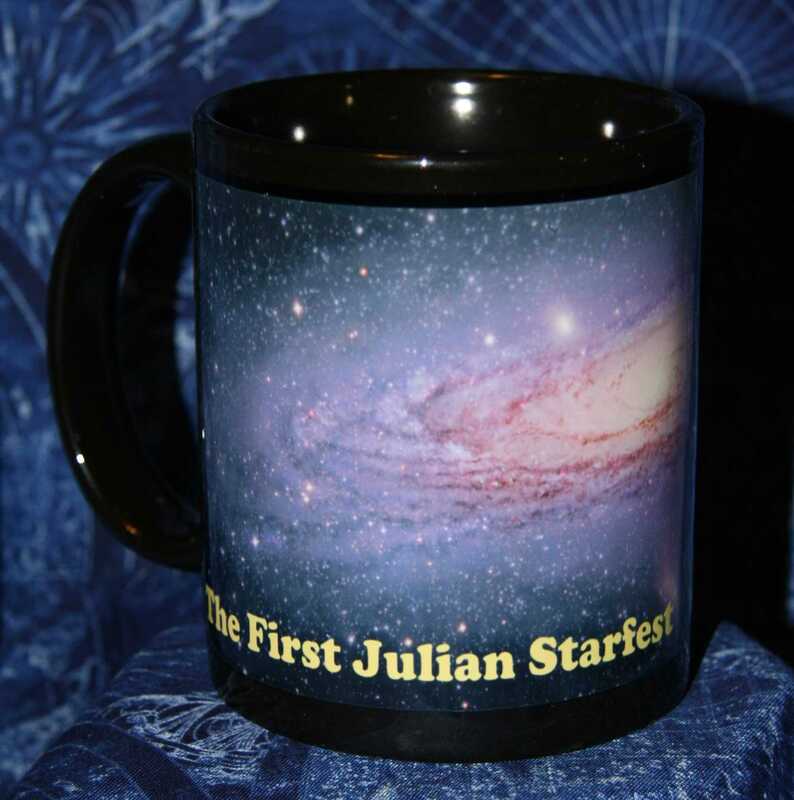 The mugs are a quality black 12oz coffee mug with a full color picture of M31 wrapped around the side. Below the picture is the text "The First Julian StarFest August, 2008" in yellow. 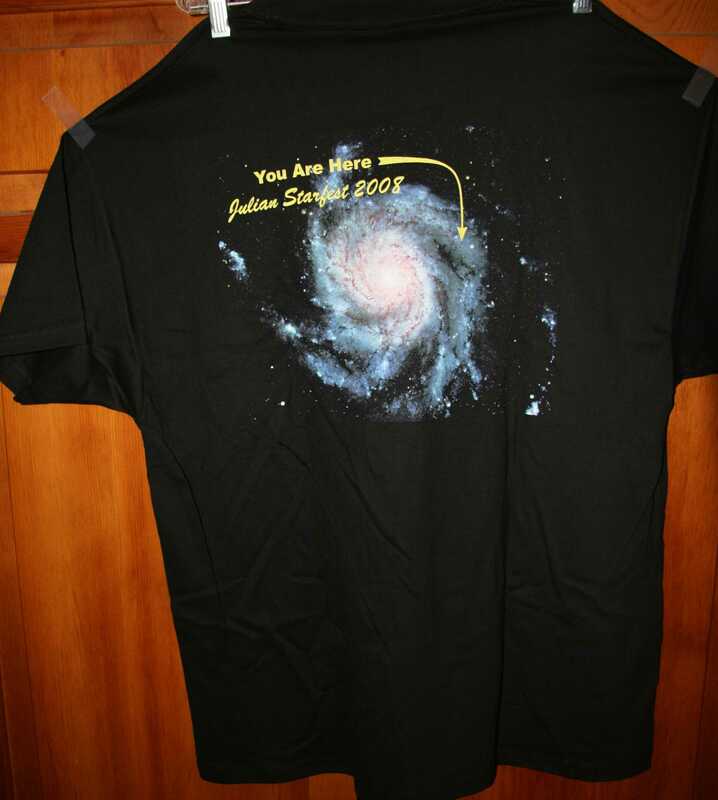 The T-Shirts are a quality, full cotton black T-Shirt with a color picture of M101 on the back and the text "You Are Here" with an arrow pointing into the galaxy. 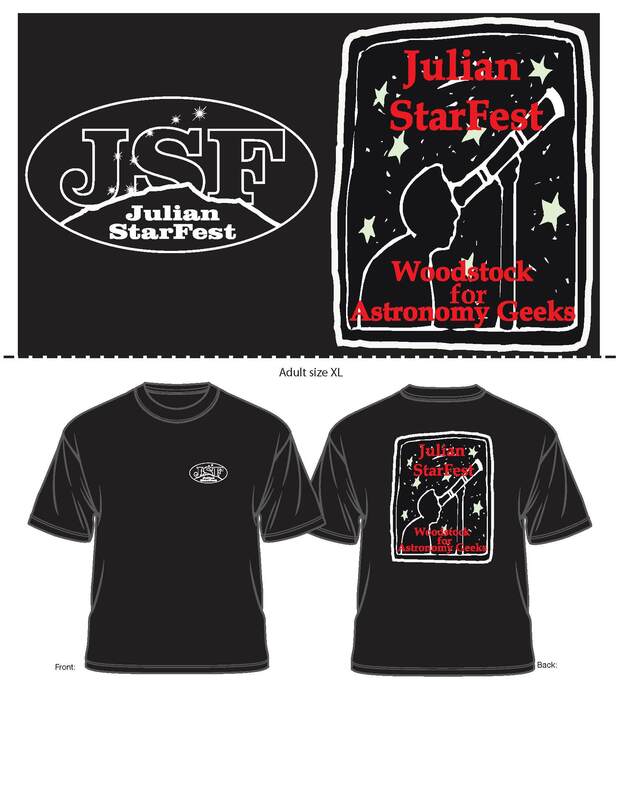 On the front of the T-Shirt is the first Julian StarFest Logo over the left breast. They run a bit small, so you may want to order the next size up. 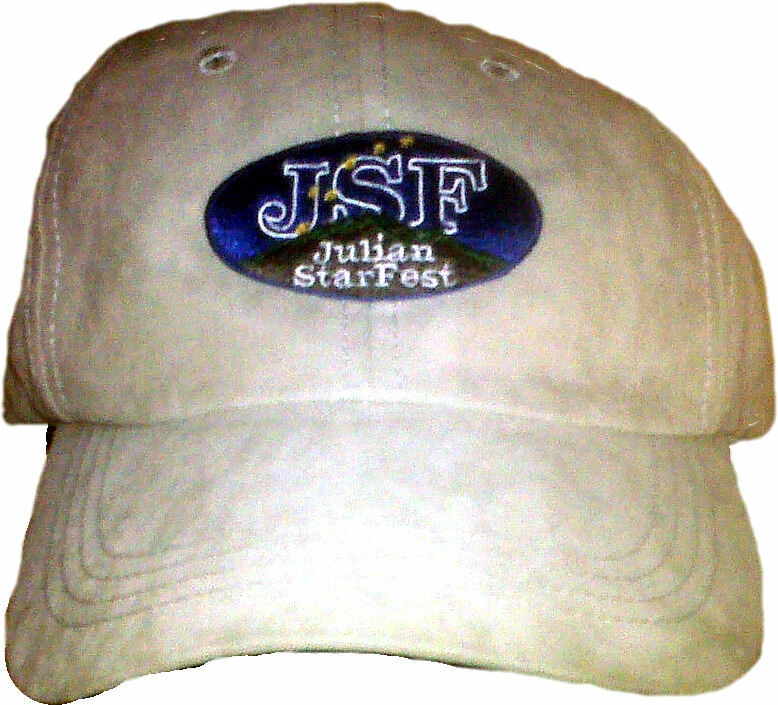 The Fine weave polo shirt with the 2009 Julian StarFest Logo and "Julian Starfest" in script below it. Various colors. The collector pins are the Julian StarFest Logo, with a SCT in the center. The background is sand blasted gold, with the text and SCT in shiny gold color. These pins are truly collectible. 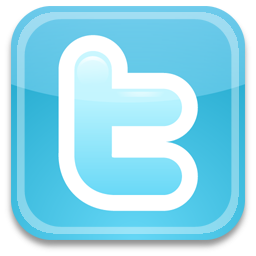 JSF merchandise is limited in quantity and subject to availability. JSF merchandise pre-orders will be filled on a first come, first served basis. Pre-ordered merchandise will be available for pick-up at the merchandise table during the event. An itemized receipt of your purchases will be necessary to pick-up your pre-ordered merchandise. Pre-orders must be accompanied by full payment using PayPal. Please note: we are not shipping pre-ordered merchandise. 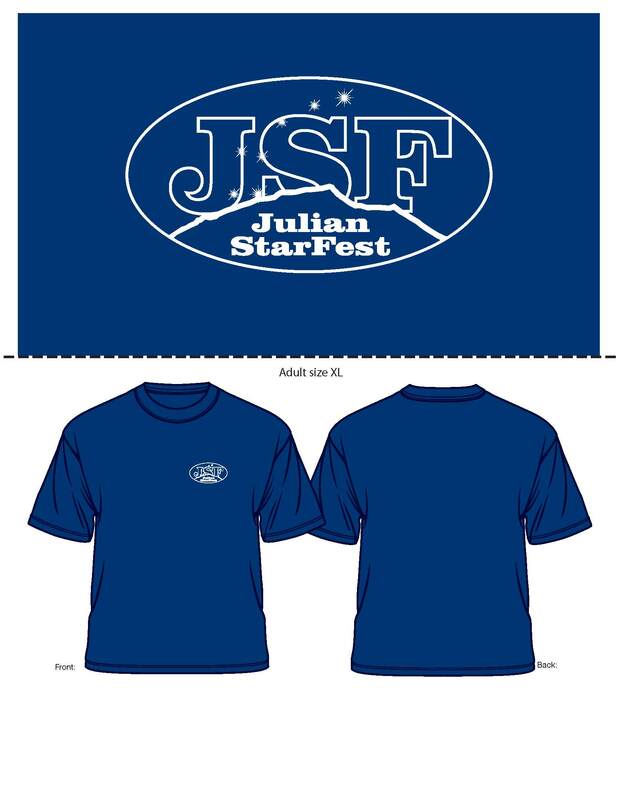 Pick up your metchandise at the JSF merchandise table in Julian this August.